It is fairly well-known that the couple, Kim Sung-do, 77, and his wife Kim Shin-yeol, 80, are the only permanent residents on the island of Dokdo. They were registered as Dokdo residents in November 1999 after living back and forth between Ulleung-do and Dokdo. Currently, four Korean citizens, including the Kim family and a lighthouse maintenance worker, officially have Dokdo as their place of residence on their social security documents. Also, a small dispatch of security police officers and representatives from the Ministry of Maritime Affairs and Fisheries are stationed on the island. Quite a few people know that Kim Shin-yeol is a Jeju haenyeo, but only a few know what made her migrate for work from Jeju island to Dokdo. Having lived for more than 50 years at the nearly uninhabitable islet, the reality of her life was harsher than the turbulent ebbs and flows of the sea she had worked in for several decades. Kim Shin-yeol’s hometown is Hallim-eup, in the western region of Jeju Island. 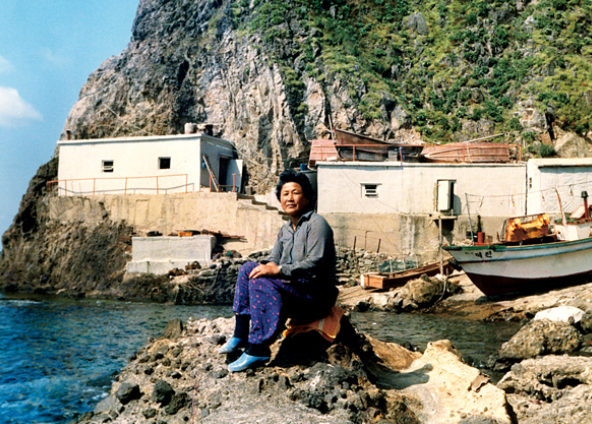 She migrated to Dokdo for work in the mid-1960s and met her husband Kim Sung-do, a fisherman by trade at that time. They got married in 1967 and have made Dokdo island their permanent home since then. The island has no adequate facilities or infrastructure, including drinking water and electricity, for a long-term stay. Their daily routine on the island involved getting up at 5 a.m every morning and taking their 1.5-ton fishing boat out to nearby waters. Now, as the couple are both ill and fragile, they can no longer work at sea. Instead, to continue to inhabit the island, they have been running a ‘Dokdo Love Café’ since 2013 where souvenirs such as T-shirt and handkerchiefs are sold for tourists. 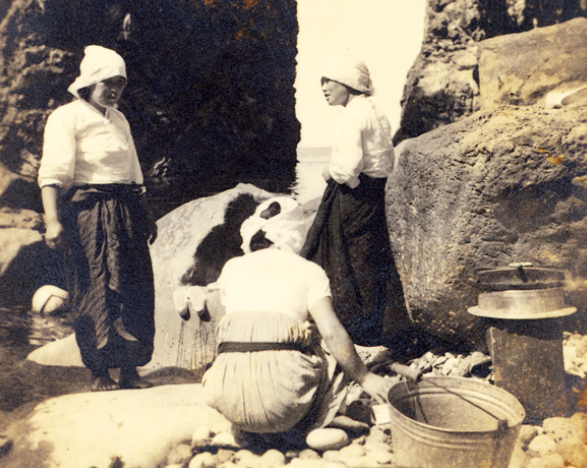 Haenyeo women divers have migrated overseas to dive as hired labor since the end of the nineteenth century. They have dived in seas as far away as China, Russia and Japan as well as domestic seas such as Busan, and Ulleung-do to make a living. They continued to migrate until the early 1980s in search of areas of more abundant marine products, as the seas around Jeju were subject to overfishing and left desolated by Japanese fishermen during the Japanese occupation of Korea. Choa Hae-gyung, a researcher with Jeju haenyeo and former director of Jeju Haenyeo Museum said the yearly visits to Dokdo by Jeju haenyeo started from as early as 1953. After Korea’s liberation, Dokdo began to be known to Jeju haenyeo as a very rich fishing ground offshore. Jeju haenyeo came to Dokdo to harvest sea mustard in the 1950s and also helped with the Dokdo Volunteer Guard which was formed by Hong Soon-chil, a young man from Ulleung-do to protect the island frequently ravaged by Japanese fishing boats and patrol boats. The Guard landed on Dokdo in 1954. To inhabit the island and make their own expenses for the purpose of defending against Japanese, the Guard hired women divers of Jeju island to harvest sea mustard in full scale. It was possible after the Guard earned a legitimate right to harvest marine products in the fishing grounds of Dokdo. Though there was a set season for picking sea mustard, 20-40 haenyeo stayed on Dokdo for about 2-3 months at a time to harvest sea mustard. They continued to work on Dokdo until the 1970s and 1980, making their living on Dokdo and contributing to building a civilian settlement of the territory. 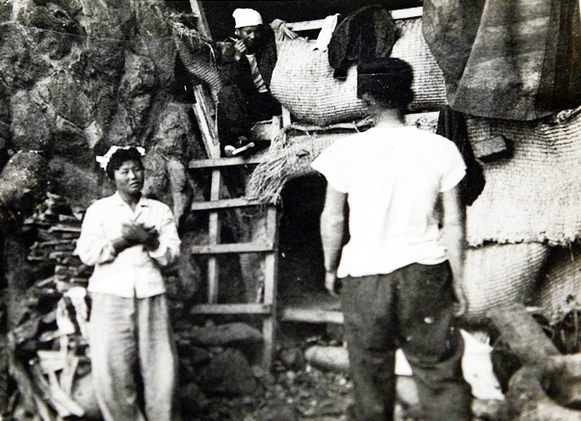 Although the haenyeo went to Dokdo for economic reasons in search of work, their presence there was also seen as a patriotic act. In addition, on August 28, 1954, the guard barracks and boundary stones were being installed there, lumber transported from Jeo-dong on Ulleung-do were unloaded into the sea from the boat. At that time, Jeju haenyeo helped retrieve the lumber that sank to the bottom of the sea and bring them ashore. There is one researcher who claims that without Jeju haenyeo, the Guard could not have lived for more than 3 years at that time. Kim Su-hee, former research professor of the Dokdo Institute at Yeungnam University, published a research paper in 2012 on ‘Perceptions of fishermen on Dokdo fishing ground and their fishing activities after the independence of Japanese rule.’ Her research shed light on Jeju haenyeo’s lesser-known contribution as a role to help the Dokdo Volunteer Guard as well as making a living by harvesting marine products. “Although Jeju women divers stayed on Dokdo only during fishing seasons, they undoubtedly contributed much to the creation of a civilian settlement on Dokdo through regularly spending 2-3 months and sometimes as long as 4-5 months, at a time to harvest marine products,” said professor Kim in an interview with the Jeju Weekly on Sept. 25. “It is very regrettable that the role and contribution of Jeju haenyeo hasn’t received proper attention while that of the Dokdo Volunteer Guard is being highly recognized and even heroized in a way,” claimed Kim. Located 87.4km away from Ulleungdo Island, and formed entirely from volcanic rock, Dokdo is an isolated island off the east coast of Korea. Korea’s sovereignty over Dokdo is contested by Japan. The two civilian residents Kim Sung-do and his wife, Kim Shin-yeol from Jeju residing on Dokdo for long decades, are “living witnesses” of justifying a claim of habitation on Dokdo. There are still a handful of haenyeo including Go Soon-ja, and Hong Soon-ok living on Jeju who still vividly remember how they lived in Dokdo, asking why Japanese think they own this.